1. Click on the InLoox PM or InLoox now tab and then click on Projects. 2. Double-click to open an existing project. 3. To open the document list, click on Documents in the Start tab. 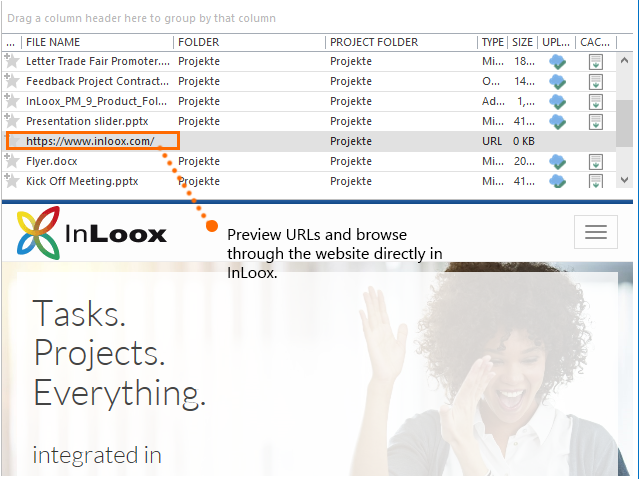 In addition to file types such as Word, PowerPoint or Excel, stored web page URLs can now also be previewed in InLoox. You can even browse the website directly in InLoox - no need to open an extra browser window. For more information on user permissions browse the articles how to set user permissions and user permission options. The Settings tab in InLoox now! has a different design than in InLoox PM. Reason for this are the different storage places. In InLoox PM your documents are saved on your file or SharePoint server, whereas in InLoox now! the documents are stored in the cloud. 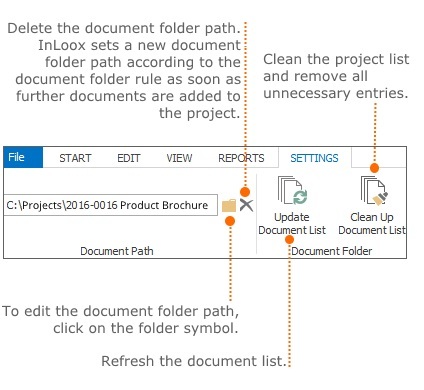 For more information on the document folder path, see Save and edit the document folder path (Only for InLoox PM). The Settings tab in InLoox now! only displays the occupied storage capacity in the cloud as a percentage. The context menu provides you with all important core features that are also included in the Ribbon. To open the context menu right-click on any point in the document list. The entry All documents displays all documents which are saved within the project. The entry Favorites displays all documents which have been marked in the ribbon as Favorites. 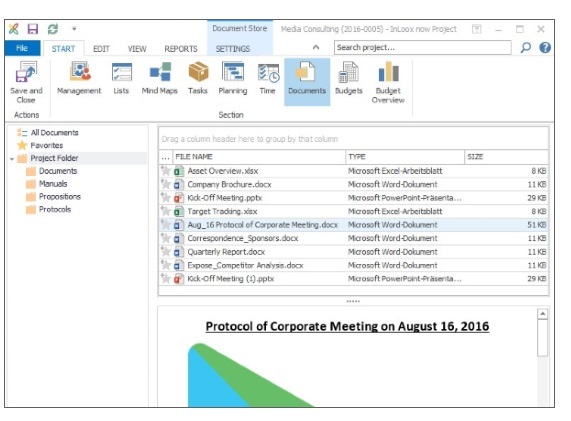 The entry Project folder displays all the documents of the project file store excluding subfolder content. 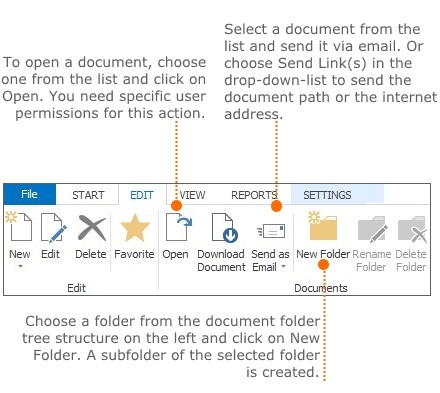 The Project folder can contain subentries by the means of a tree structure, representing the physical structure of the file store or the SharePoint system. Choose a document from the document list in order to see it in the preview area. The preview area allows you to see the whole document with several pages. 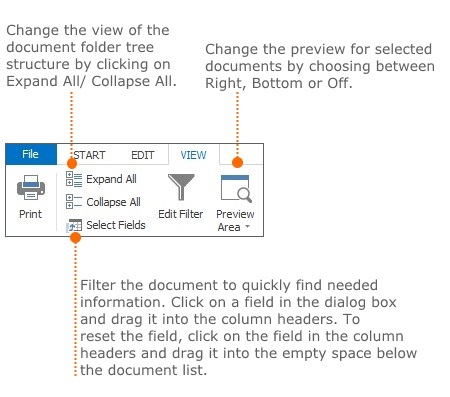 In the preview area you can directly use Copy and Paste features in the document. If a lock icon is displayed in the document list, you have no reading permission. In this case no document will be displayed in the list. The document list in a project • Copyright 1999-2019 © InLoox, Inc. All rights reserved.